The Châtillonnais passed through history and has a rich Gallo-Roman and medieval heritage, as well as an industrial heritage from the XIXth century. The Vix vase is the essential emblem of the territory and it is one of the most beautiful testimony of Antiquity. 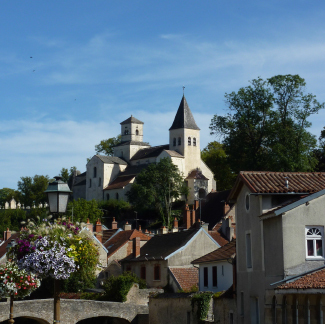 The city is classified among "the most beautiful detours in France", Châtillon is a pleasant and shady town, bathed by the waters of the Seine river. The dukes of Burgundy had a good intuition and established one of their residence in the city. They built a castle of which you can nowadays discover the vestiges. Nearby, the Saint -Vorles church is a rare pre-Romanesque building from the Xth century. It houses pieces from the Renaissance including an impressive Burial of Jesus. It is said that, it was in this crypt that the miracle of lactation took place, when Saint-Bernard received a few drops of milk from the Virgin Mary. Finally, the source of the Douix, that used to be considered as a healing sanctuary, is now enjoyed by speleologists, lovers of legends and of photography! Gallo-Roman cities, tumulus, necropolis, housing and farm from the protohistory reflect the archeological richness of the Pays Châtillonnais. From Victorine de Chastenay, a big-hearted countess, to the Marshal Marmont, from Anne of Austria, mother of Louis XIVth, to Joffre, these famous personalities have walked in our streets. Our history is told through the rural and local heritage: wash-house, calvary, dry stone hut, church... will punctuate your walks. The Vix vase is the essential emblem of the territory and it is one of the most beautiful testimony of Antiquity. This masterpiece realized by Greek bronze smelter from south Italia, dating from the VIth century B.C., was discovered in the grave of a Celtic princess in Vix, a small village near Châtillon-sur-Seine. Lying on a chariot, the woman was adorned with precious jewels, including a golden torque. 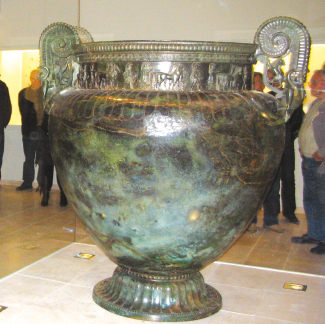 Next to her, there was the famous bronze vase of an exceptional dimension (1m64) and with a wonderful aesthetic. You can admire this vase in the Museum of the Pays Châtillonnais - Vix Treasure in Châtillon-sur-Seine, that is the background of a wonderful archeological collection and tells the story of the territory.